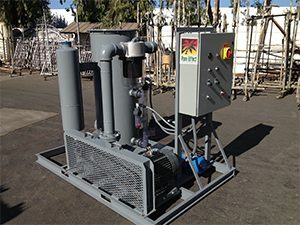 Soil Vapor Extraction (SVE) System Rentals - Fullerton, Santa Ana, Anaheim | Pure Effect, Inc.
November 13th, 2018 Pure Effect, Inc. Pure Effect, Inc. can provide you with essential services to help solve your most pressing and challenging soil remediation challenges. Soil vapor extraction remediation systems (SVES) rental is often required to reduce concentration of volatile contaminants typically found in petroleum products adsorbed into the soil within the unsaturated (vadose) zone and has to be completed in phases. In this technology, a vacuum blower is applied through the wells near the source of soil contamination and needs to undergo proper extraction and remediation. Vapor phase concentration, vapor extraction systems (VES) rate, and vacuum data are important factors that Pure Effect, Inc. carefully analyzes and reviews prior to designing and selecting the best VES to meet your soil remediation project goals and objectives. SVES can be mounted on skids and open trailers that Pure Effect can provide based on what works best for your project needs. Our diverse and complete package offering of trailer and skid-mounted SVES systems are designed to effectively and efficiently apply a vacuum to a well in order to remove chlorinated solvents or petroleum contaminated vapors at your project site. The complete package we offer includes soil vapor extraction (SVE), VES, air sparging, groundwater pump and treatment, and combinations of soil vapor and water treatment. Our SVE vacuum systems are capable of extracting volumes ranging from 50 cubic feet per minute (CFM) blowers to 1000 CFM blowers. Depending on what your project remediation needs and phase may be -- whether you need 250 CFM blower or 500 CFM blower -- Pure Effect will provide it for you. All our SVE systems are available for rental or purchase.